Welcome to the Tabby Face Block Lotto! 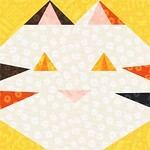 How would you like to win a pile of Tabby Face blocks made by quilters from all over the world? During the month of September, make up to five Tabby Face blocks, mail them to the address below, and be entered to win. One lucky quilter will win them all! 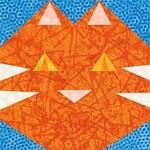 Use the free Tabby Face pattern to make a quilt block. Pattern also available on Craftsy! Use a bright tone on tone or solid background. Red, yellow, blue, orange, etc. work great to make that kitty face stand out! Please avoid pastels and black backgrounds. Blocks must finish 5 1/2″ when trimmed. Make sure your printer is set to “no scaling” or “actual size” for best results. This step is very important. Blocks that are the incorrect size will not be included in the lotto. Please staystitch 1/8″ from the raw edge of your block and then remove the paper. Staystitching helps prevent stretching on bias edges and removing the paper will help save the sanity of the winner! Embroidered (hand or machine) whiskers are optional. Please sign block(s) with your name and location on the front, lower right of the block (bottom of the kitty face or in the background fabric) using a quality fabric pen. Micron Pigma Pens are awesome for signing! You may enter up to 5 blocks. Each block receives one entry. If entering more than one block, try to make each of your cats different. The more variety, the better! Please include your name, mailing address and email address on a 3″ x 5″ card with each block you enter. This is very important as it is how the winner will be chosen, contacted and the blocks mailed. 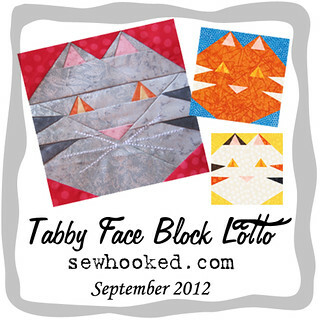 To be entered to win, mail your blocks to Tabby Face Block Lotto c/o Sewhooked; 12903 Margit Dr. Austin, TX 78729, USA. Blocks must be received by October 1, 2012. Winners will be announced October 2. Spread the word with copy and paste HTML badges for your website or blog! If you downloaded Tabby Face prior to today, please note that there is a minor update to the pattern. The pattern itself has not changed, but I added an optional note for a nicer finish. To celebrate the Tabby Face Block Lotto, use coupon code TABBY in my Etsy shop to receive 10% off your total order during the month of September! 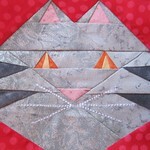 This entry was posted in Block Lotto and tagged block lott, cat face quilt block, free pattern, quilt block lotto, tabby face on September 1, 2012 by Jennifer Ofenstein. Count me in, Jennifer. Love the little face! This is GREAT! I can’t wait to make and send mine! What fun! Thanks and I will sooooo spread the word! My pleasure! I LOVE giving stuff away and this is such a fun easy way to collect an awesome prize to share! Good luck with the quilt show! Thanks Jennifer! Will get them signed and mailed out….just posted a little diddie on my blog about the “Lotto” with of course ‘links’ back to you! Thanks for the fun! I don’t understand your new direction on the pattern about adding C and E last. It just isn’t clear to me. Please explain if you have time. Thank you! No problem, I have had a couple of people ask. Piece your block as usual, but don’t add the pieces where there is an *. 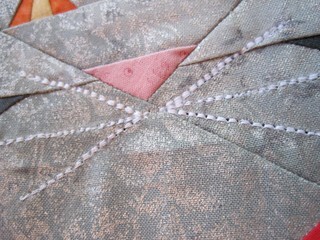 Once the block is all pieced, add the * pieces (C* & E*) as one piece of fabric. That will eliminate a seam line and give you a nice, perfect corner. AHA! It took me awhile to see the sections with the * I thought you were using it to highlight your point. Thank you for your reply and again, what a cute, cute kitty! I’ll have a couple out to you in tomorrow morning’s mail. Hopefully they’ll make it in time for the lotto pull!